The featured irocku piano lesson takes you for a frolicking journey down the Mississippi River with a New Orleans legend, Mac Rebennack, a.k.a. Dr. John. From his best selling 1973 album, Right Place, Wrong Time, “Such a Night” is a funky, light and bouncy song that showcases the musical heritage of the Delta. Dr. John’s piano playing is 150 years in the making, it is steeped in Southern culture, and when it accompanies his uniquely funky vocals, you have a fusion of soul, funk, blues and boogie that are all part of this great New Orleans sound that the Dr. has dedicated his life too. From the opening notes, “Such a Night” skips along at a moderate tempo, the melody is bright and airy, with funky breaks and pauses that are accented by the virtuosity of Dr. John’s playing, his fingers running effortlessly down the keyboard. The song is about a man stealing his buddy’s girl; yet, as delivered by Dr. John it seems ok. The music transcends the message, as the good doctor himself says, “if I don’t do it, somebody else will.” With 50+ years of playing to his credit, Dr. John epitomizes the musical traditions of the Mississippi Delta. He is New Orleans music, its roots, trunk and branches manifested in the coolest cat of them all and also one irocku’s musical mentors. “Such a Night” has a basic four-beat rhythm in the left-hand but, in signature style, Dr. John throws in every technique in the book. When playing this song consider the left hand to be a percussion instrument, keeping a steady ‘four-to-the-floor’ beat. Work the left hand until it grooves smoothly and then gradually add your right hand. With his right hand, Dr. John (“Mac”) plays swung eighth-note and sixteenth-note triplet runs using both pentatonic and blues scales that can be quite challenging. Mac has a large hand span so he can play tenths with ease- for the rest of us we’ve incorporated octave chords into the lessons. If you have the reach, give the tenths a try. Mac ends with a classic New Orleans turn-around walking down from the minor third. Enjoy! 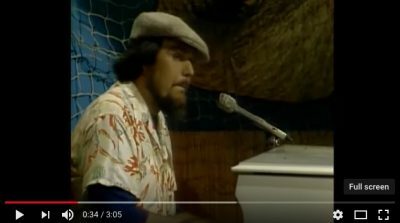 “Such a Night” is on the list of top rock piano songs of all time and Dr. John is currently ranked eleventh in our ongoing survey of Great Rock Piano Players. Who is your favorite rock piano player?